We took Evie on her first ever picnic this week. Hopefully it’s the first of many this summer. We are so lucky to live in such a beautiful place. But St. Ives does gets VERY busy in summer and it can be frustrating trying to find a spot to sit where there’s space for Evie to run around, as well as somewhere you’re sheltered from the pesky seagulls. Just past the Tate Gallery and Porthmeor beach, the cliff path opens up and there is a little spot called ‘Mans Head’, named for a rock that looks very much like a head. Home to lots of dog walkers but thankfully not many seagulls, this was the perfect spot for us. The walk to ‘Mans Head’ is about ten minutes and the path is slightly inland which makes it safe for little ones to run free. Evie had lots of fun finding sticks along the pathway and was so excited to get ride up on daddy’s shoulders. We were really surprised that she sat down and ate nicely on the grass because she always eats in a high chair. She was so well behaved and absolutely loved picking and choosing foods from her little lunch boxes. Obviously being surrounded by cliff edges doesn’t make the best spot for children to run around, but there was lots of space in this little opening for Evie to play safely. We’re so happy that we got some lovely family pictures. We normally always forget to take a camera. Our first ever date together was a picnic, so it was lovely taking Evie for her first picnic date. I love picnics. They’re such a fun summer activity and are a great excuse to go for long walks in the country or by the seaside. Have you been on a picnic with your family yet this summer? Which spots are your favourite? If you liked this post then check out my Cornwall page. This is lovely. My sister-in-law lives in St Ives – what a beautiful place to be able to go for a picnic! Thanks for hosting #whatevertheweather! Picnics are great, you can have loads of fun and adventures. It looks like you had a lovely time together in a beautiful place too. I’ve never visited St. Ives, it looks lovely! Oooh I bet she absolutely loved it!!!!! We love picnics! Sounds like the perfect day at the beach! Aww, lovely photos! That’s so nice that Evie can play where her dad grew up and spent lots of time. Fingers crossed she doesn’t start cliff jumping though, at least not until she’s a lot older! We love picnics too, although my two don’t sit so nice and still for it. Looks like she really loved her picnic. I hope you manage lots more picnics together this summer, you live in the perfect area for them! We are planning lots of picnics this summer – we’ve just taken out family membership for the National Trust so we definitely be making the most of it. Wow such a real pretty place! And since you know the place well you know those secret spots where tourist doesnt know which is awesome! I wish we can do picnic here too. I live near the beach but the weather is a bit of a letdown. Rain is okay but when you add wind.. going to the beach is no longer an option! What a beautiful place! I would be at the beach everyday…of course if it’s crowded that isn’t fun with little ones. On our vacation we had a beach all to ourselves one day and it was glorious! Thank you so much for hosting #whatevertheweather! St Ives is gorgeous but I can imagine it is going to be very busy for the next few weeks. Looks like you found a perfect picnic spot and I must say I always found mine ate more on family picnics, it is something about the fresh air I’m sure! I hope you have many more this summer. Thank you for joining in with Country Kids. It is a beautiful part of the world, but yes it gets incredibly busy during the summer. And those seagulls are naughty aren’t they! I’ve seen photos of St Ives before and I’d love to visit one day! It’s very beautiful! It looks lovely and quiet – I get frustrated with crowded picnics too! Oooh, what a gorgeous spot for a picnic! Perfect day. Your blog is lovely and welcoming, I love it! 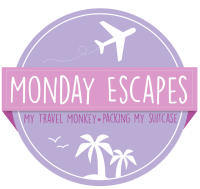 Found you from Mondayescapes…..beautiful post and so happy to have found your blog! Discovered you through #MondayEscapes..what an amazing place to live! Beautiful!